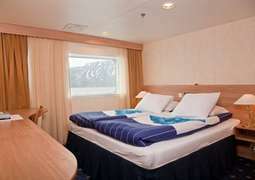 The MS Expedition offers its guests a welcoming environment with a variety of cabins furnished to give you maximum comfort. 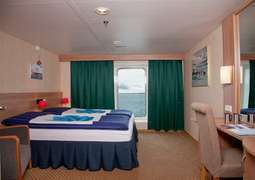 You have the choice of booking a suite, double, triple or quadruple cabin, depending on your needs and preferences. As you dine onboard the MS Expedition you will be served a diverse selection of gourmet dishes prepared by professional chefs. Breakfasts and lunches are served buffet style, while dinner is a four-course meal. Boredom is never an option with your days starting at 7:30AM. Daily excursions will vary depending on location and weather conditions, with a goal for one zodiac or shore excursion per day, two if possible. At the Polar Bear Pub live musical entertainment will often be found during the evenings. Comfort is very important; therefore we suggest you bring casual and practical clothing. The ship is well heated, so for this reason we recommend bringing clothes you can easily layer.